Location: STL, MO Looking to buy a good shock for my 300. Not interested in Gabriels, Monroes or Kayabas. Was thinking about Bilsteins, Koni's etc. The Classic Koni's are twin tube and I am wanting monotube Any experience out there? Is it the same s-10 front shock like the 57-58's run? The car wallows around and yaws so badly in a crosswind I was thinking about putting a string on the hood. A lot of it is the 8.00-15 "looks like a bias ply" coker parade ground tires but the shocks are ancient so they are part of it. Looking to run the Diamond back WW 255/70/15 that's built off the radial T/A, That should stiffen things up a bit. I'm wanting this thing to drive like a 300 not a town car. Location: N.W. Fla. On my '60 Plym I used KYB KG4507 on the front & KG5511 on the back. Back is direct bolt on, front will need the mounting tubes on the bottom narrowed a bit. Location: STL, MO Any idea what the KG4507 is for? BTW thanks George. Location: STL, MO Was just on the ph. w/firm-feel when you texted in Nathan, looks like a set of Bilsteins might happen. Good info. Location: Netherlands Bilsteins and Koni's are in a different league than the KYB's, Gabriel or Monroe "upgraded bicycle tire-pumps". The higher priced shocks 'dampen' the suspension movements in a better and controlled way, while the cheaper ones just try to resist movement. NOS shocks should be showcased museums or on trailer queens. Bilsteins and Koni's are in a different league than the KYB's, Gabriel or Monroe "upgraded bicycle tire-pumps". 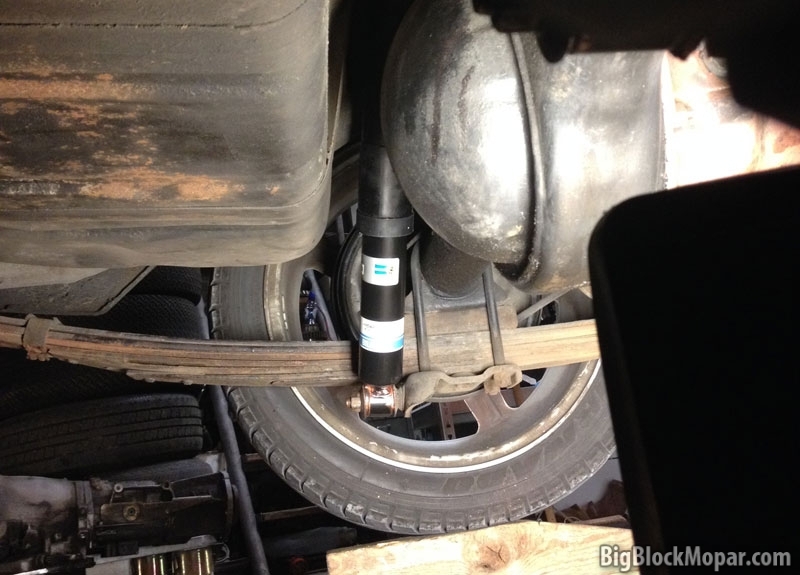 Got a Bilstein part number for the 57-61 full size application? Or do they offer dual Bayonet ends in that size? And can they be used "upside" down (Reservoir assembly body side)? Location: STL, MO Ordered Bilsteins from FirmFeel today, Cross referenced them off the kayaba part#s George sent and referred to Nathans confirmation of what the front shock fits. FF tech guy took info called me back today and shocks are on their way. Herman I couldn't agree more, I ran KYB's on my 58 Plymouth and they were okay but this will be better as it should be. Sid when I get them I'll fill you in. Thanks fellas, Tires are next. Location: So. California I just read your original post. If you want to fix wander, the radial tire will help a lot. But additionally, you should increase your caster. You should be able to install offset bushings in the UCA to get a caster increase out of it. Location: STL, MO I really can't say it's wander, it's more like yaw which Im thinking has to be those tall skinny looks like a bias ply but its a radial tires. I've read the reviews on them and people seem to like them but maybe they are on a 3200 lb Bel-air not a 4400lb 300.The car just seems to overpower or drive over these tires. Feels like your driving on inner tubes I just did the front end on my RR this fall and installed a set of those Moog bushings your talking about. It would be wishful thinking to think this 300 will handle as well as the RR w/60's and a rear bar, small block no less. But any thing will be an improvement over the way it is now. Location: northern germany Thanks for the info Steve. Location: Netherlands Just noticing this topic again. Thanks for updating.